In both tables the field value is indexed. The query returns correct results in 0.73 seconds. This is exactly our case. MySQL, as well as all other systems except SQL Server, is able to optimize LEFT JOIN / IS NULL to return FALSE as soon the matching value is found, and it is the only system that cared to document this behavior. The assumption that t2.id should be defined as NOT NULL, however, is too strong, since a successfull JOIN on equality condition implies that the value found is NOT NULL. Since MySQL is not capable of using HASH and MERGE join algorithms, the only ANTI JOIN it is capable of is the NESTED LOOPS ANTI JOIN, which is exactly what we see in the query plan (despite the fact that MySQL doesn't call it that). However, this behavior is what an ANTI JOIN does: it checks the values from the left table against only one of each distinct values in the right table, skipping the duplicates. This query is as fast as the LEFT JOIN / NOT NULL, however its plan looks quite different. First, it mentions a DEPENDENT SUBQUERY instead of a second table (which was used in the LEFT JOIN / IS NULL). Nominally, is a dependent subquery indeed, since we don't have a join here but rather a SELECT from a single table with predicate in the WHERE clause. This is of course our good old friend, the ANTI JOIN. MySQL applies EXISTS optimization to the subquery: it uses the index scan over ix_right_value and returns as soon as it finds (or not finds) a row. NOT IN is different in how it handles NULL values. However, since both t_left.value and t_right.value are defined as NOT NULL, no NULL value can ever be returned by this predicate, and MySQL takes this into account. Essentially, this is exactly the same plan that LEFT JOIN / IS NULL uses, despite the fact these plans are executed by the different branches of code and they look different in the results of EXPLAIN. The algorithms are in fact the same in fact and the queries complete in same time. This query of course produces the same results. Execution plan, again, is different. MySQL is the only system that produces three different plans for three different methods. The plan does not differ much: MySQL does know what an index lookup is and what EXISTS is and it does combine them together. EXISTS in MySQL is optimized so that it returns as soon as the first value is found. So this query in fact is an ANTI JOIN as well as first two queries are. This query, however, is a little bit less efficient than the previous two: it takes 0.92 s.
This is not much of a performance drop, however, the query takes 27% more time. It's hard to tell exact reason for this, since this drop is linear and does not seem to depend on data distribution, number of values in both tables etc., as long as both fields are indexed. Since there are three pieces of code in MySQL that essentialy do one job, it is possible that the code responsible for EXISTS makes some kind of an extra check which takes extra time. MySQL can optimize all three methods to do a sort of NESTED LOOPS ANTI JOIN. It will take each value from t_left and look it up in the index on t_right.value. In case of an index hit or an index miss, the corresponding predicate will immediately return FALSE or TRUE, respectively, and the decision to return the row from t_left or not will be made immediately without examining other rows in t_right. However, these three methods generate three different plans which are executed by three different pieces of code. The code that executes EXISTS predicate is about 30% less efficient than those that execute index_subquery and LEFT JOIN optimized to use Not exists method. That's why the best way to search for missing values in MySQL is using a LEFT JOIN / IS NULL or NOT IN rather than NOT EXISTS. Great article, which I’ve often cited in answers on SO. However, I’m struggling to understand how your conclusion reconciles with [Optimizing Subqueries with `EXISTS` Strategy] which (to my reading) suggests that `NOT EXISTS` should be *more efficient* than `NOT IN`? Grateful for your thoughts. @eggyal: first, NOT EXISTS and EXISTS (anti-join and semi-join) are very different things using different plans. The former cannot be efficiently rewritten using the outer table leading, not with nested loops, the second can. Second, the article you’re linking concerns the difference in handling NULL values (EXISTS is bivalent, IN is trivalent). This is a very interesting subject however I did not cover it in this article. Its a Great analysis, whichever i saw in forums. Its really practical examples are used and every one will understand easily. this return 0 rows, can you explain that? @dhamaso: what’s t.type? You don’t have a table called or aliased t in your query. When id_item is a null due the left join, all other fields are NULL as well. This sql has not result! This sql has result ! If the two sqls is the same meaning,who tell me why? OK,I know the error . is slow but it works great. Excuse me, a topic out, but Who is better between “in” and “not in” if the values in “in” are a lot than values in “not in”? @oscar: what do you mean by “who is better”? Please clarify your question. This is more fast other than. hi is there someone who can help me according to this query. I need those users which u_id dosn’t match in user_team column u_id. In versions before 5.6 (? ), “IN ( SELECT … )” would repeatedly perform the subquery. This led to terrible performance. In 5.6, the subquery is ‘materialized’ and an index is dynamically built. Both of these steps speed up the processing a lot, but not to the point of being as fast as LEFT JOIN. @RickJames: it’s not entirely true. It would repeatedly perform a subquery indeed, but not the subquery. It would push the predicate inside the subquery, so in our case SELECT value FROM t_right WHERE t_right.value = t_left.value is what would be called in a loop, not the original SELECT value FROM t_right. With proper indexing, it works quite well. 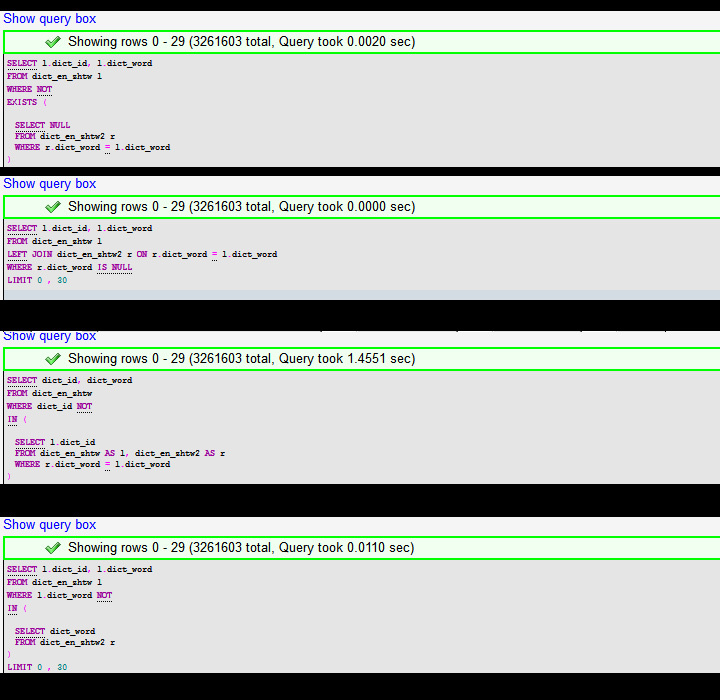 I have cleared cache (FLUSH QUERY CACHE;) before querying.. dict_en_zhtw have 3.2 million rows, dict_en_zhtw2 have 1000 rows. Query 2: 0.000 second ? My database is MariaDB 10.1.8, table format is innoDB. @Terry: why do you join with dict_en_zhtw inside the IN in your query 3? Thank you for the article, it solved an empasse I was having. I don’t agree it’s the best way, it’s the more response time efficient and it is the best only if that perfomance is an issue. For example you didn’t measure the memory aspect of the query. But most important to me, clarity of code was an issue because I had a stack of joins and negated conditions. A 30% performance hit in a query executed once a day is equal to zero; in exchange I fixed a bug and left a cleaner, much more semantic code. Developers are much slower than cpus and much more expensive. There have been a number of improvements in the Optimizer since 2009. To the Author (Quassnoi): Please rerun your tests, and specify which version they are being run against. Note also that MySQL and MariaDB may yield different results. To the Reader: Test the variants yourself, do not blindly trust the conclusions in this blog. There is another MySQL join type called cross join. Can we used cross join in the scenario you have mentioned above? I think it should work to display the data. But I am new to MySQL so I might be mistaking as well. @Oliver: no we can’t. CROSS JOIN yields the cartesian product of the tables or data sources which we can then filter on (effectively making it an INNER JOIN). There is no way to filter the product on “something which does not exist in another table” short of using the actual EXISTS or NOT IN clause, but we don’t need the CROSS JOIN at all then.